The Minagof brand is by Ishii Brewing, a craft brewery consisting of a couple from Japan but living and brewing on Guam. They currently make 3 beers. The Pale Ale is widely available, relatively speaking, the IPA is available in only a few locations on tap, and the Porter is a rare liquid. Each one is pretty good and they all have their own pros and cons. The Pale Ale was the first Minagof I tried. 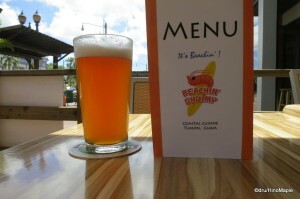 I had it on tap at a shrimp shop called Beachin Shrimp. It was one of their highest selling locations, according to Yukiko Ishii. 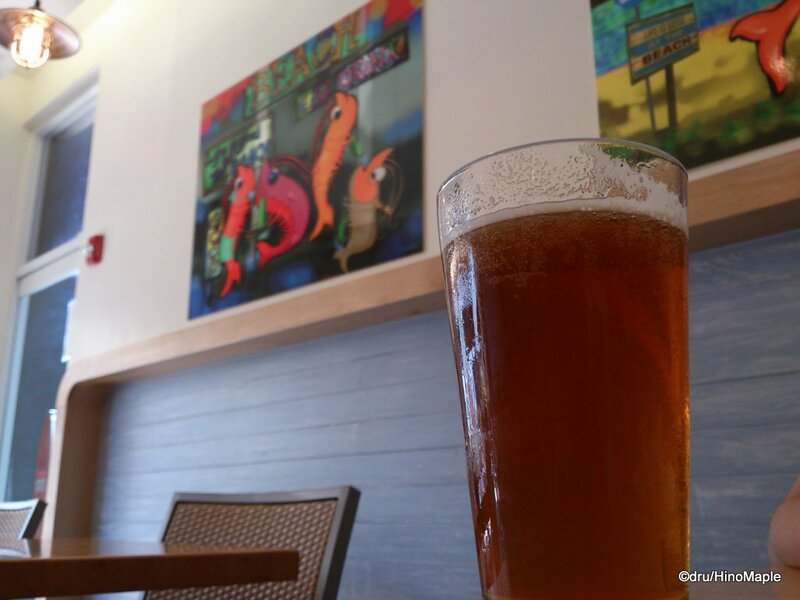 I also had a couple pints of the Pale Ale at California Pizza Kitchen, a large chain of upscale pizza restaurants. I thought it was a good beer and a great standard. It was not too hoppy and not too sweet. It was a great refreshing drink compared to the terrible Guam1 that was sickly sweet for me. I felt it could use a little refinement for my own personal tastes but on its own, if they are happy with it, I wouldn’t change a thing. The home brewer in me likes to fiddle with recipes in my head but I don’t have the resources or time to do so. The only thing I might have a real gripe with is the fact that they served the beer in chilled glasses. Living in Japan for quite a while has gotten me accustomed to drinking from a regular non-chilled glass. This is because the condensation of a frosted mug can add water into the beer. I know it is very minimal but I wonder what a non-frosted mug would be like. The Minagof IPA from Ishii Brewing was pretty good. It was well hopped but not to an extreme or double IPA level. The only problem I had was with the bottled version. Bottles and kegs are very different and I found the keg conditioned beer was a lot better than the bottled beer. The bottle had a strange smell to it, but it could have been the fact that I was drinking from a small plastic cup rather than a proper pint glass. It could have also been due to the maturing inside the bottle. For home brewers, we know how to do this and I felt they could have used a bit more sugar to help condition the beer better. There was barely any sediment at the bottom of the bottle which helped increase my suspicions that the beer wasn’t conditioned properly. I made sure I also had the IPA on tap and when it was tap it was delightful! The hops used were pretty good and it gave a good bitterness that works very well on hot days. I would recommend it to a lot of people but I’m not sure I would recommend the bottles as much. It does take a certain taste to enjoy it but the beer on tap was done perfectly. The Porter is the newest beer from Ishii. 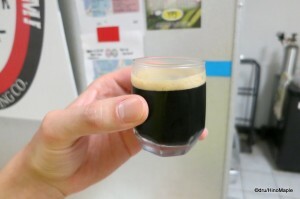 It is nice and dark as any Porter should be and it had a nice coffee and nut flavour. 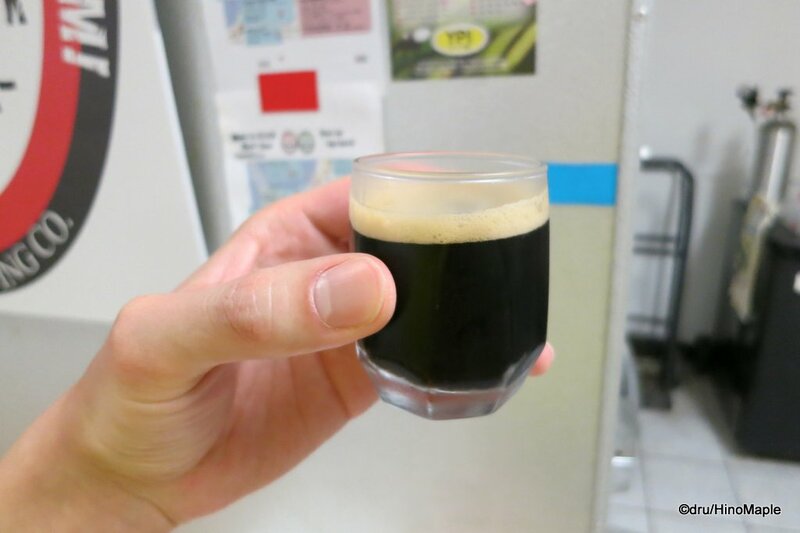 The carbonation was not very strong but there was a hint of smoke, like hickory or some other wood within the Porter. The aromas were not very strong at the brewery but the bottle I brought back to my hotel definitely had some wood aromas although I’m not sure what kind. Out of the 3, this was my favourite. I enjoyed the subtle flavours of the Porter that had me guessing what types of malts they used, or how they prepared their malts. Since I learned how to make beer, I grew to play the guessing game when it comes to craft beers. For regular commercial beers, I don’t often try to guess as I am not trying to replicate their recipes. Porters may not be for everyone but the Minagof Porter is something I think people would enjoy. They really play to the heat of Guam by making beers that are surprisingly not heavy and it goes well with the heat. 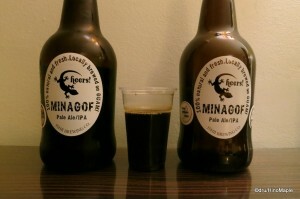 If you are in Guam, do me a favour and go and get some Minagof beer. It is not cheap if you buy from the convenience stores, but in the restaurants, if you see it, grab it. It is better than the commercial American stuff you see. If you stop by the brewery, pick up a bottle or two and drink it in your room. You can even take the bottle home and use it for water or anything else. It is a great bottle and I even brought mine home with me. 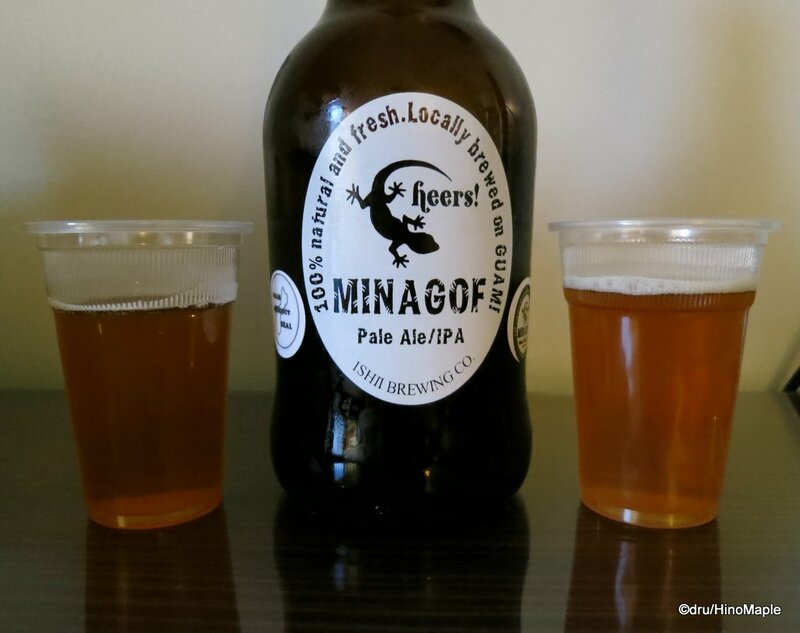 This entry was posted in US Food and tagged beer, Guam, IPA, Ishii, Ishii Brewery, Ishii Brewing, Ishii Brewing Company, Ji-Biru, Minagof, Minagof Beer, Minagof IPA, Minagof Pale Ale, Minagof Porter, Pale Ale, Porter by Dru. Bookmark the permalink. I love the logo too. Really cool.